So, I figured that since it's the end of the week, I really ought to let all (eleven) of you know which episodes I managed to watch so far. I don't get to write about every episode but I wish I could. I think about all of them but I just don't have the time to make a post about every single one. Not sure if I mentioned this but there's A LOT of Star Trek out there and this blog is a moving train. -"Time Warping" has its own music. -Wow, those away mission coats are FANTASTIC. Why didn't they keep those around? -Uhura is my new girl crush. It can't be helped. -I eat A LOT of salt. I wonder if I'm a salt monster who forgot her natural form. -Hey, this kid isn't too bad. -LOL This is the best space gym ever! -Does the costumer repair all of Kirk's ripped shirts after they shoot or do they just make new ones? -Those silver eyes look pretty amazing. -This is still early enough that they're hitting the "Spock's an unfeeling alien" thing pretty hard when Kirk says, "Will you try for one moment to feel? At least act like you've got a heart!" But it's about a lot more than that. Still, shirtless Sulu is pretty awesome. -Although I love the concept of this episode, it's not one of my favorites. I think a lot of that has to do with the last line, when Spock asks Yeoman Rand, "The impostor had some very interesting qualities, wouldn't you say, Yeoman?" Seriously? 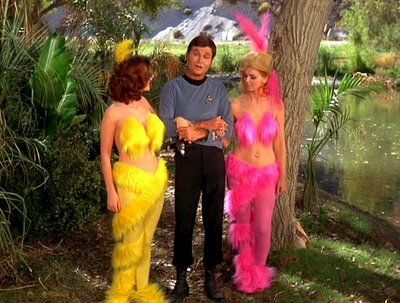 I know you feel like you had to end on a laugh but it should've had something to do with the space dog, the away team, or anything other than Yeoman Rand almost getting raped. -Interesting. The crystals that power the ship are called "lithium" and not "dilithium" in this episode. 7- What Are Little Girls Made Of? -Majel Barret is pretty amazing here. Christine Chapel is a totally heartbreaking character. 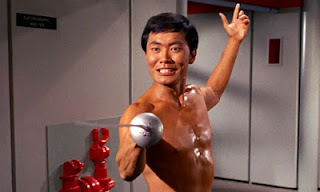 They're about the become the first official "Red Shirts" to bite it in Star Trek. -"Bonk! Bonk! On the head! Bonk! Bonk!" -Is this the first use of Shakespeare in Star Trek? Not sure. -It's definitely the first mind meld. -This one has the first variation on "I'm a doctor, not a ___" when McCoy says, "What am I, a doctor or a moon shuttle conductor?" -We see A LOT of the Kirk from Wrath of Khan. He's getting older, he's gained a bit of weight. He doesn't like any of it and he's definitely not losing to some mysterious alien. -This feels like a clip show. Had clip shows been invented yet? Is this the first clip show? I guess it's not technically a clip show since, at the time, no one had actually seen these clips. -SERIOUS use of Shakespeare in Star Trek. I wish I'd had time to write about this one in detail. Maybe I'll come back to it. -First time we see Romulans and boy, they look a lot like Vulcans. Quit being so damn racist, Stiles! Geez. -Mark Leonard is fantastic here. No wonder they brought him back as Sarek. -Man, 2009's Star Trek really missed an opportunity by not making their "Burly Cadet #1" (who calls Kirk, "Cupcake") the man who was revealed to be Kirk's bully while at the Academy--Finnegan. -Here's another episode I might come back to later. -I remember talking to my dad about how "That Squire guy" was obviously a Q, when I was a kid. My argument has changed none at all. Apparently this question is answered in one of the novels. -I really want to do some Gorn-themed art. -The remastering really did this episode some favors. 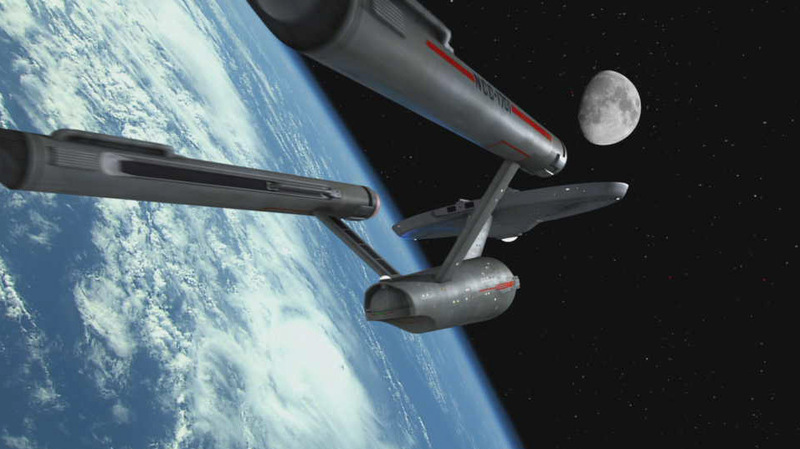 I almost cried watching the Enterprise in orbit around Earth. Tell me that's not one of the most beautiful things you've ever seen. -I can't wait for "Measure Of A Man" to come around. I'm SO going to write about this episode when that happens! -Why don't they ever explain why everyone goes crazy at 6pm? How is that part of Landru's plan? Alright, kids! That's it for this week. I got 22 (counting the pilot) episodes into Star Trek: TOS and I can't wait for more. You're absolutely right. I ought to go read that book (and more by Peter David) !